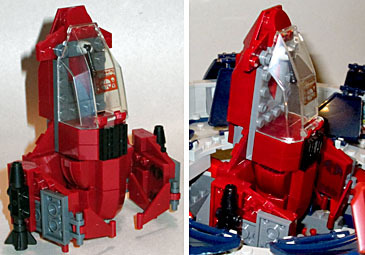 In today's review of the Kre-O Terror Drome, I mentioned that it fit the Firebat, but didn't include one. So here's where you get it. 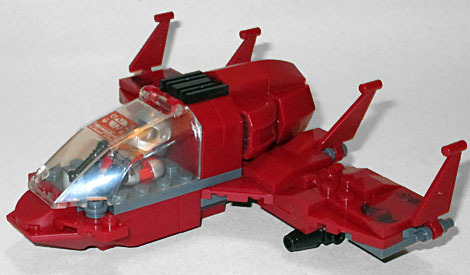 The Firebat is dark red, with grey accents. It's 4⅜" long, 1⅞" tall and has a 6⅛" wingspan when they're fully extended. Yes, just like the classic toy, the wings on this one are hinged, and fold over the main body for storage - that's how it fits into the Terror Drome's launch silo. The Firebat launches vertically, but how on earth does it come back in to land? The canopy opens, and there's enough room for the AVAC pilot to sit inside. A sticker goes on the glass to create the Firebat's HUD, and two more on the back end make for air intake vents. There's a control stick in the cockpit, and two bombs under the wings. There are four tailfins along the back - two against the body, two at the ends of the wings - and a pair of stabilizing front canards. It's impressive how well the design has been translated to brick form. The AVAC is nice as well. 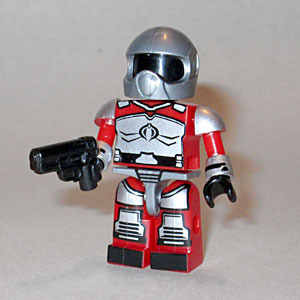 He's wearing his red and silver uniform, but the only bit of it that isn't merely painted on is his helmet - and the head beneath that is solid black, with no painted details at all. You may wonder why a pilot needs so much armor, but why does he need a pistol, either? Figure he has to land the plane at some point, and it may not necessarily be in friendly territory. And hey, maybe the armor helps him withstand the tremendous G forces he experiences while flying. 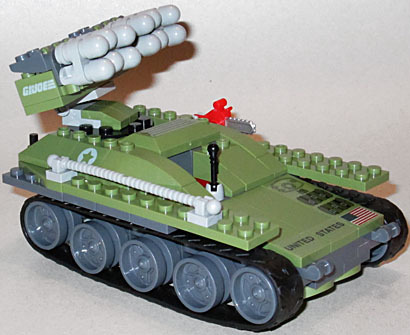 On the Joe side of things, we get the Wolverine, the missile launcher tank. It's 5¼" long, 2⅞" tall, and 3⅛" wide. It has real working tank treads, with the front and rear wheels raised a bit higher than the rest, for better clearance in rough terrain. There are tow-hooks on the front and back, a rescue cable on the right side, and a chainsaw on the left. A hatch behind the driver's seat opens to reveal storage for the included axe and bundle of dynamite. Of course, the Wolverine's trademark was the battery of 12 missiles it carried in its dual racks, and this one keeps that tradition alive. The launcher rotates and hinges, allowing you to aim, and the rockets actually fire, using a clever friction-based mechanism to fling two at the same time. 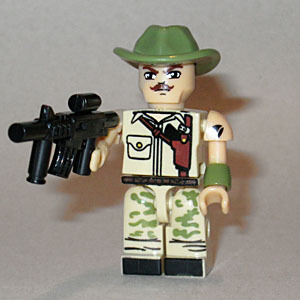 The Wolverine's assigned driver was of course Cover Girl, meaning that at last we have our first Kreon figure of... wait, Recondo? Huh? How did the guy who explores the jungle by himself get put into the seat of a tank? He's wearing his usual tan shirt and camo pants, but there's a small mistake here: they forgot to paint the tan on his shoulders, so it looks like he has bare arms. That would be fine, if not for the black symbol tampo'ed on his left shoulder. Whoops! His hat is just a cowboy hat, not a slouch, but it has a bump at the back so he can hold it in his hand if he wants. He's armed with a large black gun. Our final figure is "Sgt. Katzenbogen," which doesn't mean anything to anybody. But when we say he's Bazooka, suddenly that makes a lot more sense. 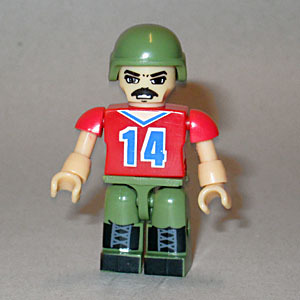 Kind of a dope in the cartoon, Bazooka's filecard described him as "a decisive fast-thinker with all the instincts of a natural survivor" - knowing the way the Kre-O sets like to make their characters sweetly inoffensive (even the villains), they'd probably treat 'zook the same way Sunbow did. 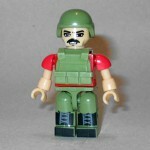 Bazooka gets a green helmet and the same sort of military vest we've had to cut off so many Transformers Kreons. It does sort of make sense for him, since his Generation 2 incarnation did wear a similar bit of padding. It was totally boring, though, and since this vest isn't being used to attach anything to the figure, you can feel free to just take it off him. Underneath, you'll find that he's wearing his more familiar "14" jersey, finally making him look like the character you remember. It's painted on nicely, and his boots are pretty complex, too. 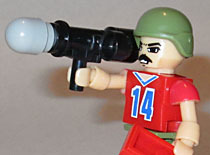 He comes with a bazooka rocket propelled grenade launcher that actually has a projectile in it, and a viewfinder that can be held up to his eye. Additionally, there's a Frozen Fudgee Bar, just like Quick Kick had. And now I kind of wish I'd gotten his best buddy Alpine from Series 4 of the blind bags. This entry was posted in addendums, blog exclusive review, Hasbro and tagged GI Joe, Kre-O. Bookmark the permalink.